This was originally published elsewhere, but that site is defunct, so I am reprinting it here. You've already done candle magic in church and at birthday parties. You're probably already done some candle magic. Have you ever blown out the candles on a birthday cake and made a wish? Candle magic. Lit a candle in a church or other holy place as part of a prayer, or even in place of a prayer? Candle magic. Candle magic can be as simple as the examples I've listed above, or it can be incredibly complex. The level of complexity is always up to you. Once you have dedicated a candle to a specific purpose, it can't be used for anything again. 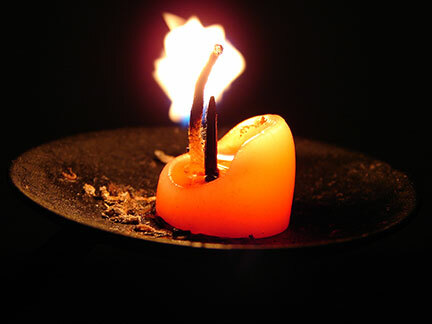 The candle should eventually completely burn down to a stub, so don't use a big huge three-wick pillar candle! You can use a tiny tea-light in a metal tin, or a taller votive candle. It's best NOT to use a candle in a jar; although of course you want to put the candle you are using in a holder. To dedicate the candle for a purpose, you can do a number of different things. You can simply hold it in your hands and "charge" it with your energy and your wish. You can write your wish in a piece of paper and place it beneath the candle (in a way that it won't be able to catch fire). What I like to do is carve my wish, or a symbol of my wish, onto the candle with an old pen (one that's run out of ink). For instance, if I was doing a money spell, I would just carve a dollar sign onto a green candle. For love, I'd carve a heart on a pink or red candle. I also impart my energy into the candle, of course. That brings us to the next stage: color. What color should your candle be? White is good for everything. If you don't know what color to use, use white. If you are trying to banish something, you can use black. For instance, you may want to banish your debt. Carve the word "debt" in a circle with a slash across it on a black candle. At the same time, you might burn a green candle for increased money. Green is also good for healing, as is blue. Pink for romantic love, red for passionate love or for increased energy. You can check my Color Magick page for more correspondences.